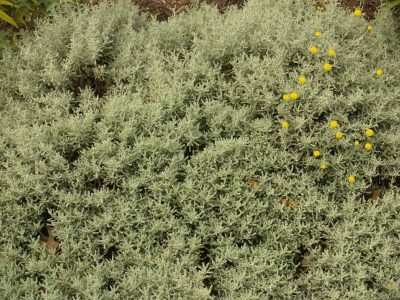 Santolina (Santolina chamaecyparissus) is a wonderful groundcover for alkaline or rocky beds. In heavier soil it benefits with some decomposed granite mixed in. It’s tight silvery foliage is a wonderful accent against greens and colors in the garden. It produces small yellow or purple flowers from spring to early summer. Mostly, we grow this one for its distinctive texture and that standout silver. The leaves are pungent, so it’s said to be deer resistant. Of course, this does not mean it’s deer proof! Santolina is a dense, small mounding plant to about 1′ by 1′. Plant it in full sun, though it tolerates a bit of shade. It requires little water, so be careful not to overwater, especially in clay soil. It’s hardy to well below 0 degrees.